Cardcaptor Sakura Wallpaper: Takaku Tobe! Minitokyo »	Cardcaptor Sakura Wallpapers » Cardcaptor Sakura Wallpaper: Takaku Tobe! The title means "Fly High!" in Japanese. I challenged a CLAMP scan. But well, it's off season to vector Spring theme. Why not? Sakura-chan is just too cute. From all the CLAMP vector wallpapers I've seen, most of them said vectoring CLAMP scans are soo hard. However, I had fun vectoring Sakura-chan with lots of frills... outlining the frills was so fun. Ironically, adding the frill shadings almost killed me. From the comments I got from my Halloween wallpaper last time, my shading was not really that good, neither vector or painting. So I swore myself not to blur but I still did in some parts but I think it's effective. For vector shading, I made 2-6 layers for each part. I was able to make 2 layers for the frills. The finished vector took 2 1/2 days, 1 day for outlining and the rest for coloring and adjusting. Comments and fave is appriciated. Really nice vector! The details are lovely, I espcially like the shading! I can see where you used a little blurring, and it works. Great job! Are you a member of ? We'd love to have you and your lovely winged wallpaper! This is so cute! Really beautiful! Thanks for sharing! Awesome job on the Sakura wall! I Love it! Its never too late to post a spring time wall. What matters is that you worked hard to make it for people like me to enjoy it. Love it! wow. this is a very clean bright vector! it looks amazing! is it ok if i alter it to 1920x1080 for my monitor? One of the best vector you have made :D i love the soft colors and shadings. oh, this is so kawaii! It will goes directly to my desktop! I really do love CCS forever... (L) Thanks for did this! Just So Beatiful! thst very pretty so much Kawai! sakura and kerochan, vectoring amazing! This is such a cute wall, very nicely vectored. I love the brightness and multi-shades all over her dress and hat. shaped, it's rather long and kinda weird looking. Thank you for making to the wallpaper because this scene is loved? Wowww great vector... you have done a gret job with this scan. Congratulations.. to my favorites :). Geez! I finally had the time to comment this! 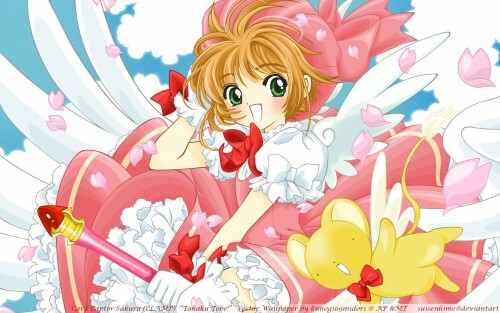 I swear, Card Captor Sakura wallpapers NEVER get old! haha. its awesome, which program you use. Really high quality and very vibrant colours! Makes me happy just looking at it, thanks! Nice wallpaper. Thanks for sharing.